STH 59 West Town Center TIA - TADI - Traffic Analysis & Design, INC. STH 59 West Town Center TIA - TADI - Traffic Analysis & Design, INC.
A mixed use development is being proposed for the southeast quadrant of the STH 59 (Les Paul Parkway/Genesee Road)/CTH X (Genesee Road/Saylesville Road) intersection in the City of Waukesha, Waukesha County, Wisconsin. Access to the site is proposed at both STH 59 (Les Paul Parkway) and CTH X (Saylesville Road) when fully constructed. The Wisconsin Department of Transportation (WisDOT) is planning reconstruction of the STH 59 (Les Paul Parkway/Genesee Road)/CTH X (Genesee Road/Saylesville Road) intersection as part of the West Waukesha Bypass project in 2018. Per WisDOT recommendations, this study evaluated traffic operations with the West Waukesha Bypass project’s proposed intersection geometrics, traffic control, and traffic volumes. Based on the analysis, TADI determined that the WisDOT design is adequate to accommodate future traffic volumes that include background traffic projections, proposed site traffic, and potential off-site traffic. The proposed site driveway to STH 59 (Les Paul Parkway) is across from an existing church driveway that is also used by the fire department. To mitigate potential future delays and improve safety for all vehicles at the intersection, a traffic signal warrant analysis was conducted and it was determined that traffic signals should be installed at this intersection. 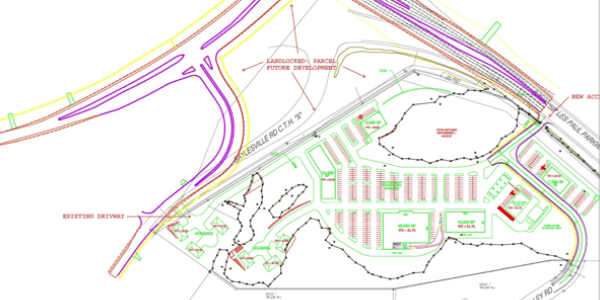 The proposed site driveway to CTH X (Saylesville Road) was originally drawn in a location that would be negatively impacted by the poor site distance expected from the near 90-degree curvature of the roadway to the new connection with CTH X (Genesee Road). TADI recommended that this driveway be moved further west across from an existing residential roadway to maximize sight distance from the curve.